I found the collection of people interviewed in ‘Founders at Work’ fantastic. It included software, hardware and web startups. O Man! Founders at Work: Stories of Startups’ Early Days was incredible. Jessica Livingston, the author, is one of the founding partners at Y Combinator. If you don’t know Y Combinator make sure you read ‘The Launch Pad: Inside Y Combinator, Silicon Valley’s Most Exclusive School for Startups’. Livingston is married to Paul Graham another co-founder of Y Combinator. I found the collection of people interviewed in Founders at Work fantastic. It included software, hardware and web startups. The interviews were frank, thoughtful and inspiring. It really felt like it gave me some great insights into what all these people went through in building their business, including the highs and the lows. It was almost like reading a mini biography on each of the founders and their respective companies. Steve Wozniak. – Apple. It was interesting getting his take on the start of Apple, having read the Steve Jobs book. It was also amazing how Wozniak build those first computers with the complete lack of resources especially money. It was a theme that occurred a few times in the book. More noticeable was when the founders did not raise money early, how the limitation in resources forced them to be more creative, and they felt looking back that was part of their success. Paul Graham – Viaweb. Having read a few of his essays and a lot about Y Combinator, I didn’t think this chapter would be that interesting. I was mistaken, I loved it. The story about how they came up with the first web-based application. That is also where the name – Viaweb came from. Philip Greenspun – ArsDigita. I was amazed how big some of the service/consulting businesses became in this era. Some of them then changed to product based, and many others seem to have hit a wall. ArsDigita was one that hit a wall, but not before Philip was pushed out by the VC, even though he was still a majority shareholder. After some litigation the VC eventually bought him out, but the business went under not long after that. His whole story about dealing with VC, although like always only one side of the story was very interesting. Max Levchin – Paypal. Sabeer Bhatia – Hotmail. Steve Wozniak – Apple. Joe Kraus – Excite. Dan Bricklin – Software Arts. Mitchell Kapor – Lotus Development. Ray Ozzie – Iris Associates, Groove Networks. Evan Williams – Pyra Labs – Blogger.com. Tim Brady – Yahoo. Mike Lazaridis – Research in Motion – Blackberry. Arthur van Hoff – Marimba. Paul Buchheit – Gmail. Steve Perlman – WebTV. Mike Ramsay – TiVo. Paul Graham – Viaweb. Joshua Schachter – del.icio.us. Mark Fletcher – ONElist, Bloglines. Graig Newmark – craigslist. Caterina Fake – Flickr. Brewster Kahle Wais – Internet Acrhive, Alexa Internet. Charles Geschke – Adobe Systems. Ann Winblad – Open Systems, Hummer Winblad. David Heinemeier Hansson – 37signals. Philip Greenspu – ArsDigita. Joel Spolsky – Fog Creek Software. Stephen Kaufer – Trip Advisor. James Hong – Hot or Not. James Currier – Tickle. Blake Ross – Firefox. Mena Trott – Six Apart. Bob Davis – Lycos. Ron Gruner – Alliant Computer Systems, Shareholder.com. 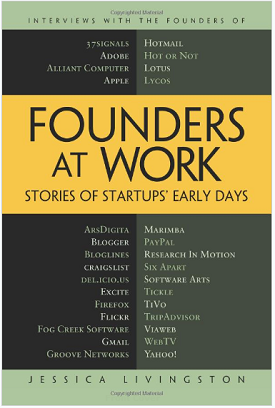 Founders at Work: Stories of Startups Early Days’ is well worth the time to read, it is long but each chapter offers great insight into starting a tech business. Get a copy today! This entry was posted in Book Reviews, Reviews on 2013/01/07 by Justinus.